The first cookbook I decided to use was put out by the Trinity Lutheran Church Ladies Aid Society, Elkhart Indiana, circa 1975. Two lifelong members of the Ladies Aid Society were mrslovey’s great-aunts, and they had given a copy of the book to mrsloveymom, who later passed it to mrslovey. Based on other recipes of the aunties that I’ve tried, I figured that any cookbook they endorsed would be safe to use for this experiment. In addition, I really liked one of the sentences in the intro: The recipes in this book have not been tested in laboratories but have been tried and tested by a special group of tasters; our family and friends. Sounds like exactly what I’m looking for! 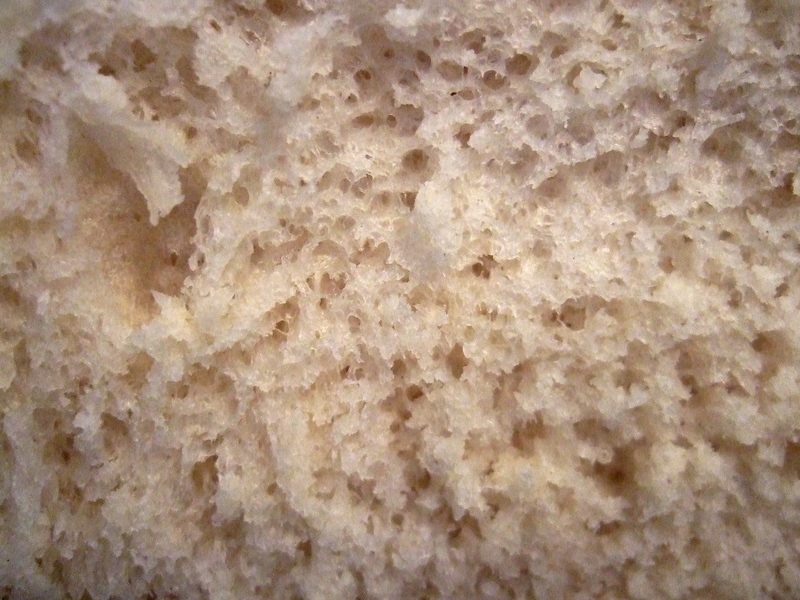 I decided on Old Fashioned White Bread, by Barbara Brumbaugh, and got to work. I was interested in the butter and milk added to the dough, and wondered how they would impact the final result. I also really liked the ‘makes a good crust special’. Really, how could I resist that?? Well let me tell you, this bread is DELICIOUS. Nice golden brown crust, and a light, airy fine-grain crumb that has just the slightest hint of sweet to it. 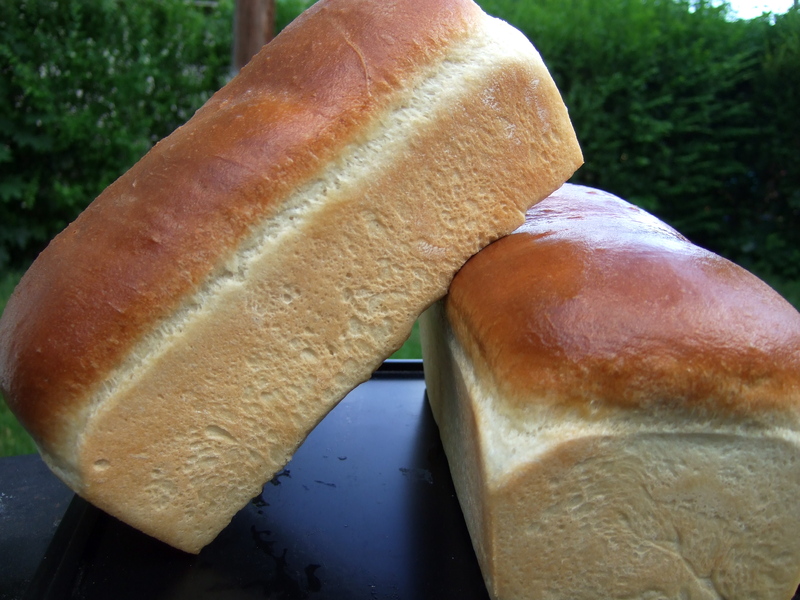 This bread will be perfect for sandwiches. The only modifications I made were to use butter instead of margarine, and I used the liquid milk option instead of the dry milk. Other than that, I followed it totally as written. You should make this bread soon, and you should make it often. I know I’m planning on it! Read the rest of this entry ? dinner roll dinner roll ding ding ding! 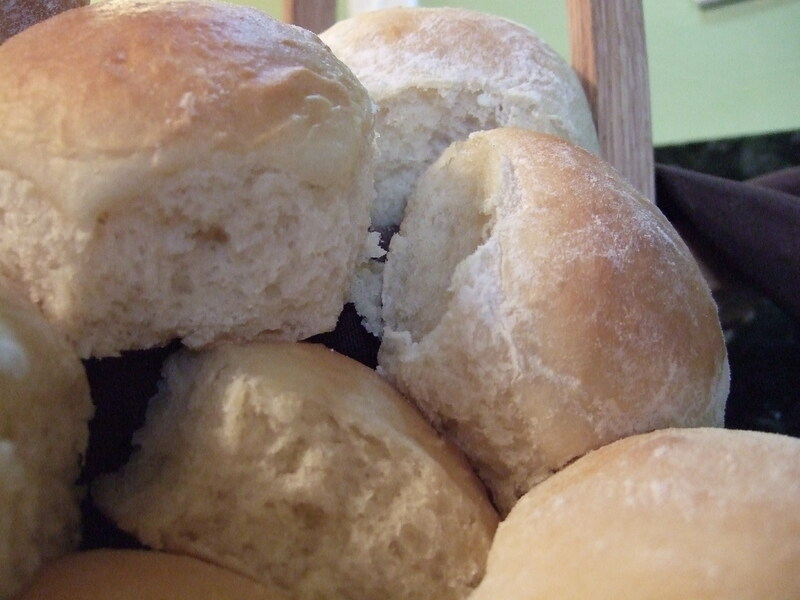 When I first started baking, one of the things that intimidated me most was dinner rolls. Yes, dinner rolls, weird, whatever. For reasons unknown, I could never get a consistent result. Some days they’d come out perfect, other days they’d just sit there refusing to rise, like sullen little rocks. It was awful not being able to commit for holidays, since I wouldn’t have any idea whether or not a particular batch would succeed or fail miserably. Nowadays, I don’t have that problem. In fact, not only am I making rolls for whichever meal I’m attending, I also have friends, coworkers, and family who are buying them (from me! with money!). Last year I made something obnoxious like two hundred rolls for Thanksgiving, and nearly that again for Christmas. And every single one came out a perfect cloud of tasty. What made the difference, you ask? I’m almost hesitant to tell, I’m afraid people won’t be nearly as impressed with them if they knew how easy these rolls are! First, I finally found the right recipe. Yes, I’m talking about King Arthur Flour AGAIN. Their recipes are so consistently good, how could I not? In this case, I discovered their Soft White Dinner Rolls. The butter, potato flakes, and dried milk add a ton of flavor, while leaving the texture light, soft, and tender. 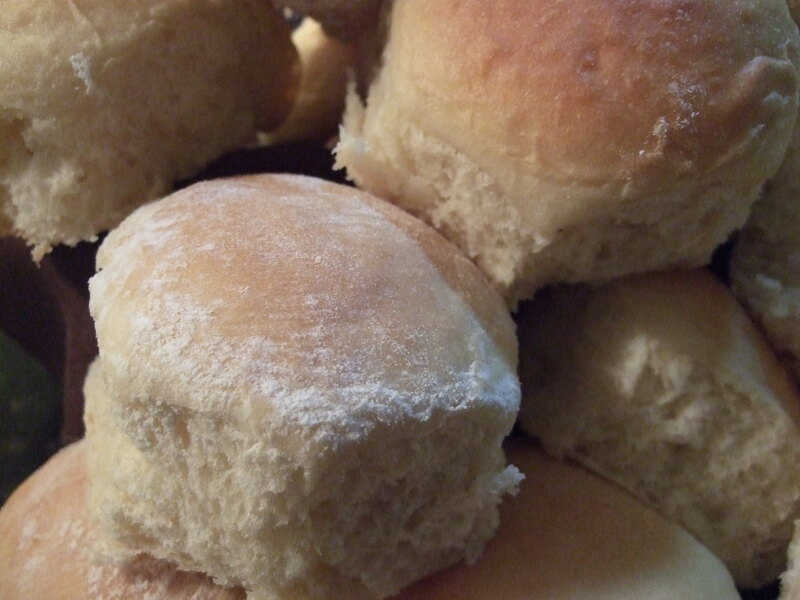 They’re delicious on the day they’re made, and they also make great little finger sandwich rolls with leftovers. They freeze beautifully, so I tend to make a double batch – eat one now, freeze the second for super-easy homemade rolls later! I do have one confession, however. I’m *not* going to tell you the shortcut technique I figured out that shaves off more than half the total prep time. Girl’s gotta do what a girl’s gotta do to keep the customers calling!